My monthly spending and budget report for June 2012. It makes me glad to report on the highest income month this year. I had above R13,000 online income. I decided to only claim my online income when its above R10,000. It takes me 2 or 3 months to get that. I am happy with my online income for now. I am happy with my Nedbank JustInvest interest. I am happy with my property income. I am totally unhappy with my dividend income. I am working on it seriously though. Hopefully my discipline will pay off. I’m not confident enough to continue picking stocks and want to go the Satrix Divi route. I am a beginner stock investor and should behave like one. I will get lower returns with the Satrix fund than if I picked the best individual stocks. However, I ma pick the worse stocks too. But the Satrix Divi is a good mix of stocks that are expected to perform well. Some will perform well but some may not. I am banking on the benefit I will get from the great performing ones. What I want is a boost in my monthly income through higher dividends. R5000 per month would be amazing. Below is my budget and spending in percentages. Real Estate 36% Down from 59% last month. I like it when my rental properties are contributing a lower percentage. 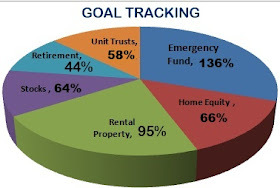 This is partly due to my online income and to a lower extent, preparing one rental unit for tenants. Hubby Allowance 24% This is not so necessary but I like it. Once off 2% Interest free loan repayments by a friend. Online 35% This is not for 1 month. I keep a hold on my payments for 3 months or more. Extra 3% Interest on my Emergency Fund. Dividends were ZERO again. On the expenditure front: we had a nice and short holiday. It started with a trip to my in-laws and ended with a short trip to Gauteng. What a cold piece of SA. It was so refreshing though. Real Estate 15.8% 1 mortgage & taxes/rates. Internet/ Phones 2.9% Broken 3G cards, contract upgrades, etc, very costly. Consumer 12.5% Groceries, personal care and all that jazz. Giving 13.8% Part of this is an interest free loan to a friend. To Invest 47% A huge part of this went to my homeloan. A small part went to my Just Invest. I am thinking of dumping the rest on the soon to be opened Satrix Divi. It’s been a great month. I have an opportunity to get back to work after years of a break. That's very confusing. Most of my investments are 100% passive, justifying my going back to work in a way. This is more so now that I decided to give all my properties but one to a property manager. Hiring a property manager makes a huge difference when you don’t want to run around fixing tiny issues. This is the second semester of 2012. The first half of the year is gone. We are given an opportunity to do better. The question is: are we gona take that that opportunity and do right with our personal finances this round.